The surname Atcherley is, as I wrote in the article which launched this website, “a good old Shropshire name”. However, over the course of Queen Victoria’s reign (and after it), the surname Atcherley became rarer in its native Shropshire, and more frequent in a number of other counties, as members of the family migrated. By 1911, the county which was home to the highest proportion of the Atcherleys recorded in the census was Wiltshire (see Census and sensibility). The man responsible for starting this branch of the ‘clan’ was Edward Richard Atcherley [ ]. Edward was part of an Atcherley family whose members were not averse to moving elsewhere to better their fortunes. His father, a tailor (also named Edward [ ]), was born in the Shropshire countryside but relocated to, and raised his family in, urban Staffordshire. Edward Richard Atcherley, born in Bilston on 4 March 1840 and baptised there at St Leonard’s church (pictured right) on the 22nd of that month, was the first-born child of Edward senior and his wife Martha, née Shaw [ ]. After moves to Sedgley and then to Wednesbury, Edward Atcherley’s family finally settled in Wolverhampton, where they were recorded on the 1851 census. At some point over the next ten years, Edward junior started work. The census of 1861 shows both Edward (aged 21) and his younger brother John [ ] (16) in an occupation which was new to the Atcherley family tree, that of forgeman. Although the term forgeman suggests the possibility that Edward and John may have each been working as (or for) a blacksmith in a small forge, I suspect they were employed in a larger industrial workplace, two of many young men assisting with the manufacture of ironware. Wolverhampton was ideally situated as a location for forges and foundries, having ironstone, coal and lime deposits close by, and good communications for the transportation of its products. However, the iron industry of the Black Country, after reaching its peak in the 1850s and early 1860s, then began to decline. Was it the onset of this decline that led both Edward and John to look for work elsewhere? Or did they make that choice for other reasons? I don’t know. John made the boldest move, emigrating to the USA in 1865. Edward Richard Atcherley was a little less adventurous and took his metal-working skills to the expanding town of Swindon, in Wiltshire. The earliest records I have found confirming Edward’s presence in Swindon date from 1866, when he married local girl Elizabeth Weeks [ ]. According to a descendant of this line of Atcherleys, Neil Duffill, the wedding ceremony took place at the Register Office in Swindon on 13 October that year. Elizabeth was born in 1847, at Lydiard Millicent in Wiltshire. The census of 1851 shows that 3-year-old Elizabeth was then living in the village of her birth, with her mother (Mary Weeks, an agricultural labourer, aged 28), aunt (Martha Weeks, also an ‘ag lab’ of 28), sister (Maria Weeks, 11 months), and cousin (Harriet Weeks, 2). There was also a ‘visitor’, Ralph Godwin, an ag lab aged 30. All of the adults in the household were unmarried, and I can’t resist jumping to the conclusion that Mr Godwin may have been the father of one or more of the Weeks children. If he wasn’t Elizabeth’s father, then he became her stepfather in 1852 when he married her mother Mary. OPENING OF THE G.W.R. CRICKET CLUB. The above account provides not only a possible date and place for Edward and Elizabeth’s first meeting, but also a very strong hint as to the identity of Edward’s employer. The Great Western Railway line had reached and extended beyond Swindon in 1840, and the following year the company began building its new central repair works nearby. The site, located a mile away from the town, had been chosen by Daniel Gooch, GWR’s Superintendent of Railways, and backed by the company’s engineer, Isambard Kingdom Brunel. A Railway Village was built to accommodate GWR’s employees, and from these beginnings New Swindon developed, a town which would remain physically and administratively separate from Old Swindon until 1900. Edward Richard Atcherley set up home there with his wife Elizabeth at 11 Taunton Street, at which address the couple’s first three children were born: Edward John Atcherley [ ] (on 16 October 1867), William John Atcherley [ ] (on 31 July 1869) and George Atcherley [ ] (on 30 October 1870). William John Atcherley was baptised at his local church, St Mark’s in New Swindon (pictured above), on 13 December 1869. I suspect he was very ill at that time and his parents knew he did not have long to live. His death was registered before the end of that month. The 1871 census therefore recorded a family of four at 11 Taunton Street: Edward Atcherley senior, age 21, a grinder; his wife Elizabeth, 25; and children Edward (age 3) and George (5 months). The baptismal records for the two boys also recorded their father’s occupation as a grinder, a job that involved finishing metal products with a grinding machine. 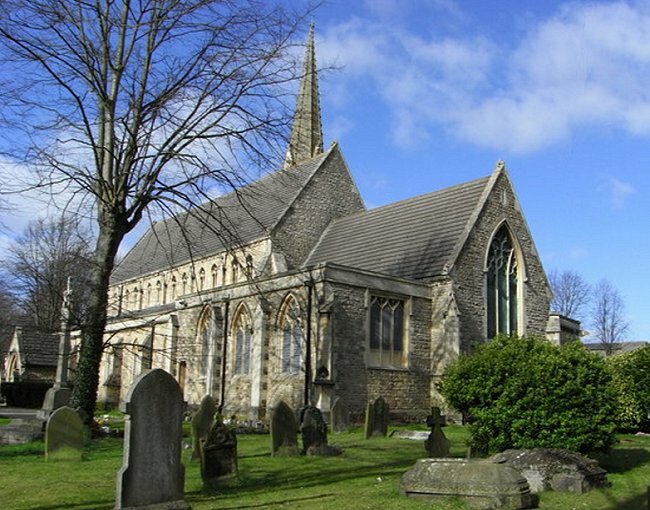 Edward junior and George were baptised not at St Mark’s in Swindon, but in the town of Wolverhampton. 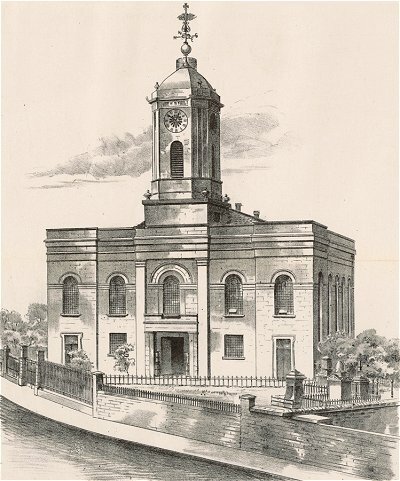 The ceremonies took place at St Peter’s on Christmas Day 1867 and at St Andrew’s on 28 December 1873 respectively – the second of those two events was in fact a double baptism as Walter Richard Atcherley [ ] (born 18 November 1872) was welcomed into the church alongside his brother George. Evidently, Edward Richard Atcherley maintained close ties with his family back in Staffordshire after his relocation to Swindon. His parents must have appreciated his yuletide visits and being able to attend the baptisms of their grandchildren. Two further visits of this nature followed, but both in the month of July. The baptism of Edward and Elizabeth’s fifth child, Elizabeth Martha Atcherley [ ], took place at Wolverhampton St Andrew on 4 July 1875, and that of their next daughter, Martha Ann [ ], was conducted there on 7 July 1878. By this time, the children’s grandfather Edward Atcherley had passed away (he died on 9 December 1877), but grandmother Martha Atcherley was still ‘alive and kicking’. Martha Ann was however the last child of Martha’s son Edward to be baptised in Wolverhampton. Four more children were added to the Atcherley family of Swindon over the following decade: Thomas [ ] (in 1878), William [ ] (1880), John [ ] (1882) and Amy Beatrice [ ] (1886). It is interesting to note that the birth records of these and of their older siblings nearly all give their mother’s maiden name as Wicks rather than Weeks, contradicting the marriage and pre-marital census records of Elizabeth (in which her surname was spelt Weeks). The records also show some of the family’s changes of address after the 1871 census. Walter Richard Atcherley’s birth, in 1872, took place at 24 Exeter Street, where the Atcherleys remained until at least 1875. But by 1881, the family home was in Albion Street, a street which would house many Atcherleys for decades to come. During his years in Swindon, Edward Richard Atcherley featured in his local newspaper, the Swindon Advertiser, on several occasions. Some of those appearances show that he got into debt, and was the subject of court orders (in 1874 and again in 1878) to pay money to various creditors, usually in instalments. The sums involved ranged from 5 shillings to £1 0s 3d, the latter being the only amount exceeding one pound. Other reports show that Edward was a member of the 11th Wiltshire Rifle Volunteers. As Corporal Atcherley, he was part of the non-commissioned officer team which beat a team of Privates (by 19 points) in a Friendly Shooting Match in 1873. Then, in 1875, as Private Atcherley, Edward took 39th place in the annual prize shooting meeting of the Corps, winning “3s and a bottle of rum, value 3s 6d”. To the Editor of the Swindon Advertiser. Sir,―Will you kindly allow me, through the medium of your paper, to tender my most sincere and heartfelt thanks to Mr. A. Skerton for his bravery in rescuing my little boy from drowning in the canal by the Golden Lion Bridge. I would also suggest that the Local Board should do something to make the bridge less dangerous to the 700 or 800 children who pass over it to school. Extract from GRO death register entry for Edward Richard Atcherley. Larger version at Flickr. Edward Richard Atcherley, described as a grinder at a railway factory, died from chronic heart disease on 18 December 1887, at his home in New Swindon’s Albion Street. But thanks in part to the rescue of one his sons in 1879, nine of Edward’s ten children survived into adulthood and most had children of their own. There are Atcherleys, descendants of Edward and Elizabeth, living in Swindon and elsewhere in Wiltshire to this day. Picture credits. Bilston St Leonard’s: Image from A History of Bilston, in the County of Stafford (published 1893), taken from the British Library Flickr photostream; no known copyright restrictions. Swindon St Mark’s: Photo © Copyright Chris Allen, taken from Geograph and adapted, used, and made available for reuse under a Creative Commons licence. Extract from GRO death register entry for Edward Richard Atcherley: Image © Crown Copyright and posted in compliance with General Register Office copyright guidance. Baschurch, Shropshire, baptism register covering 1813, entry dated 26 June for Edward Atcherley. Copies viewed at Shropshire Archives and at Findmypast – Shropshire Baptisms. Indexed at FamilySearch, Batch C03390-2, Film 502911. Wolverhampton St Peter, Staffordshire, marriage register covering 1839, entry dated 15 April for Edward Atcherley and Martha Shaw. Copy viewed at Findmypast – Staffordshire Marriages. Abstract in Wolverhampton & District Churches: Male Marriages 1834-1903, Male Surnames A-F (page 25 of PDF, under Atcheley). Indexed at FamilySearch, Batch I03176-8, Film 1040902, Ref ID item 4 p 31. Registered at Wolverhampton, June quarter 1839; vol 17, p 291. Birth of Edward Richard Atcherley registered at Wolverhampton, March quarter 1840; volume 17, page 336; mother’s maiden name Shaw. Profile page for Edward Richard Atcherley in Neil Duffill’s Ancestry member tree Osborne & Atcherleys 2; dates and places of birth and marriage presumed taken from birth and marriage certificates. Bilston St Leonard, Staffordshire, baptism register covering 1840, entry for Edward Richard Atcherley. Copies viewed at Staffordshire Records Office and at Findmypast – Staffordshire Baptisms. Indexed at FamilySearch, Batch I02190-1, Film 1040826, Ref No 397. 1841 census of England and Wales. Duck Lane, Sedgley, Staffordshire. Piece 998, book 1, folio 19, page 6. 1851 census of England and Wales. Turners Court, Stafford Street, Wolverhampton, Staffordshire. Piece 2019, folio 140, page 24. 1861 census of England and Wales. Evans Street, Wolverhampton, Staffordshire. Piece 1990, folio 151, page 13. Jane Hewitt (undated), Dictionary of Old Occupations. At: Family Researcher (website, accessed 20 Nov 2016). Frederick Calvert (1834), Picturesque Views and Description of Cities, Towns, Castles, Mansions, and Other Objects of Interesting Feature, in Staffordshire. Page 16. Copy viewed at Google Books. Michael Reed (1990), The Landscape of Britain: From the Beginnings to 1914. Page 323. Copy viewed at Google Books. National Archives, Washington DC, Passenger Lists of Vessels Arriving at New York, New York, 1820-1897, Microfilm Serial M237, Roll 255, Image 36, Line 38 (List Number 761). Passenger list for the Kangaroo, arriving New York 12 Aug 1865 from Liverpool, England and Queenstown, Ireland, shows John Aitcherty, 21, labourer, travelling from Great Britain to United States. Copy viewed at Ancestry – New York, Passenger Lists, 1820-1957. Marriage of Edward R Atcherley and Elizabeth Weeks registered at Highworth, December quarter 1866; volume 5a, page 37. Birth of Elizabeth Wicks registered at Cricklade, September quarter 1847; volume 8, page 265. 1851 census of England and Wales. Lydiard Millicent, Wiltshire. Piece 1834, folio 205, page 11. Marriage of Ralph Godwin and Mary Wicks registered at Highworth, December quarter 1852; volume 5a, page 17. 1861 census of England and Wales. Ship Inn, Swindon, Wiltshire. Piece 1272, folio 38, page 27. The Swindon Advertiser, 23 Apr 1866, page 3. Opening of the G.W.R. Cricket Club. Copy viewed at Findmypast. The Railway Works. At: Swindon Web (website, accessed 3 Dec 2016). History of Swindon. At: Wikipedia (website, accessed 3 Dec 2016). Birth of Edward John Atcherley registered at Highworth, December quarter 1867; volume 5a, page 16; mother’s maiden name Wicks. Profile page for Edward John Atcherley in Neil Duffill’s Ancestry member tree Osborne & Atcherleys 2; date and place of birth presumed taken from birth certificate. Birth of William John Atchrley [= Atcherley] registered at Highworth, September quarter 1869; volume 5a, page 17; mother’s maiden name Wicks. Profile page for William John Atcherley in Neil Duffill’s Ancestry member tree Osborne & Atcherleys 2; date and place of birth presumed taken from birth certificate. Birth of George Atchrley [= Atcherley] registered at Highworth, December quarter 1870; volume 5a, page 16; mother’s maiden name Wicks. Profile page for George Atcherley in Neil Duffill’s Ancestry member tree Osborne & Atcherleys 2; date and place of birth presumed taken from birth certificate. Swindon St Mark, Wiltshire, baptism register covering 1869, entry for William John Atcherley. Indexed at FamilySearch, Batch C05466-1, Film 943587. Death of William John Atcherley registered at Highworth, December quarter 1869; volume 5a, page 9; age given as 0. 1871 census of England and Wales. 11 Taunton Street, New Swindon, Wiltshire. Piece 1882, folio 31, page 55. Wolverhampton St Peter, Staffordshire, baptism register covering 1867, entry for Edward Atcherley. Copy viewed at Findmypast – Staffordshire Baptisms. Indexed at FamilySearch, Batch C01836-5, Film 1040896, Ref. no. item 2 p 27. Wolverhampton St Andrew, Staffordshire, baptism register covering 1873, entries for George and Walter Atcherley. Copy viewed at Findmypast – Staffordshire Baptisms. Indexed at FamilySearch (George / Walter), Batch C01198-9, Film 1517619, Ref. no. item 12 p 33. Birth of Walter Richard Atcherley registered at Highworth, December quarter 1872; volume 5a, page 25; mother’s maiden name Wicks. Profile page for Walter Richard Atcherley in Neil Duffill’s Ancestry member tree Osborne & Atcherleys 2; date and place of birth presumed taken from birth certificate. Wolverhampton St Andrew, Staffordshire, baptism register covering 1875, entry for Elizabeth Martha Atcherley. Copy viewed at Findmypast – Staffordshire Baptisms. Indexed at FamilySearch, Batch C01198-9, Film 1517619, Ref. no. item 12 p 48. Wolverhampton St Andrew, Staffordshire, baptism register covering 1878, entry for Martha Ann Atcherley. Copy viewed at Findmypast – Staffordshire Baptisms. Indexed at FamilySearch, Batch C01198-9, Film 1517619, Ref. no. item 12 p 82. Death of Edward Atcherley registered at Wolverhampton, Dec quarter 1877; vol 6b, p 345; age given as 64. Profile page for Edward Atcherley in Neil Duffill’s Ancestry member tree Osborne & Atcherleys 2; date and place of death presumed taken from death certificate. 1881 census of England and Wales. 52 Albion Street, Swindon, Wiltshire. Piece 2018, folio 60, page 18. Swindon Advertiser, 19 Jan 1874, page 5. Swindon County Court. Copy viewed at Findmypast (search term Hatcherley). Swindon Advertiser, 16 Feb 1874, page 4. Swindon County Court. Copy viewed at Findmypast (search term Atchcrley). The Swindon Advertiser, 23 Apr 1873, page 4. A Friendly Shooting Match took place on Saturday […]. Copy viewed at Findmypast. The Swindon Advertiser, 13 Nov 1876, page 5.Annual Prize Shooting of the 11th Wilts Rifles. Copy viewed at Findmypast. Swindon Advertiser, 25 May 1878, page 5. Swindon County Court. Copy viewed at Findmypast (search term Atcherly). Swindon Advertiser, 25 Nov 1878, page 5. Undefended Cases Copy viewed at Findmypast (search term Hatcherley). Swindon Advertiser and North Wilts Chronicle, 15 Mar 1879, page 8. The Golden Lion Bridge (letter). Copy viewed at Findmypast. Death of Edward Richard Atcherley registered at Highworth, December quarter 1887; volume 5a, page 16; age given as 46. PDF copy of entry in GRO register of deaths held.